Utilizing some very basic elements, the Carolina Fence™ incorporates both natural and cultural elements, which have been designated as symbols of our state. The Carolina Fence™ is a landscape component that can be adapted to a variety of settings. The Fence can function as a valuable habitat element while showcasing symbols of natural and cultural history. [Image Description] A Carolina fence surrounded by flowers and plants. So simple, yet filled with natural value, the Carolina Fence™ is a concept that involves plantings and landscaping materials that are readily found in local garden shops and nurseries. The split rail fence represents a commonly used device by South Carolinians in the late 1800's and early 1900's as farmers and landowners responded to the new laws that called for fencing in live stock. You will need two or more 6 to 12 foot sections for your Carolina Fence™. It can be laid out in "snake fashion" with no vertical posts, or as a post and rail fence. SC's State Flower, Yellow Jessamine, can easily be trained across the split rail fence to form a dense and attractive year-round foliage cover. The Yellow Jessamine, an evergreen vine indigenous throughout South Carolina, has been celebrated for its showy yellow flowers in March that herald the coming of spring. In addition, the fragrant flowers are a first annual source of nectar to many of our desirable native insects such as butterflies and bees as they stir from their over-wintering sites. This plant does best in sunny locations. Blue Granite, the SC State Stone, adds another aesthetic and official state symbol to your Carolina Fence™. Plus, butterflies will love to bask in the sun on it! See below for a source of free blue granite for schools. Native Wildflowers in a mulched plant-bed around your fence can be very attractive to the official state butterfly, the Eastern Tiger Swallowtail. The Garden Club of South Carolina has identified this butterfly species to be of particular interest to South Carolinians because it serves as a pollinator in orchards and gardens. Indian Grass, Sorgastrum nutans, is our State Grass. The flowers are often visited by bees, and birds love the seeds. The foliage is also often used for grazing by other wildlife. Our State Wildflower, Goldenrod, (Solidago spp.) is a great food source for many different kinds of wildlife. It has beautiful flowers that provide nectar for butterflies and bees. The seeds are eaten by Goldfinches and other birds. For recognition as a Certified Wildlife Habitat, certain basic requirements must be met. All habitats, regardless of size must provide for food, water, cover, places to raise young, and utilize sustainable gardening practices. To turn your Carolina Fence™ into a complete wildlife habitat, you will need to have a source of water. This can be as simple as adding a bird bath or a more involved project, such as creating a small pond in your yard. Once you meet all of the requirements, you can get your habitat garden certified as a Wildlife Habitat. Certify your garden online today! [Image Description] A Carolina fence surrounded by yellow flowers. [Image Description] A Carolina fence garden sign. 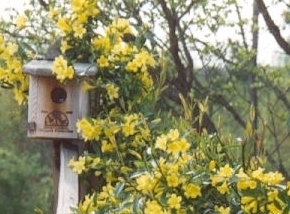 Display a SCWF Habitat Sign in your wildlife habitat garden and help spread the word about the needs of wildlife! Buying signs from SCWF keeps the money in SC to be used for conserving and restoring wildlife and wildlife habitat in our state! When you are ready to order your sign, be sure you have your habitat number, which is located on the certificate that you received from the National Wildlife Federation. Then, click HERE to order your sign online. Contact SCWF's Habitat Education Manager for more information. Email Jay Keck here or call the office at (803) 256-0670. * The Carolina Fence™ concept was developed by these W.A.I.T.™ partners: SCWF, SCDNR, Duke Power, and National Wild Turkey Federation in cooperation with The Garden Clubs of South Carolina.